How Do Glow-Worm Boilers Compare With Worcester Bosch? If you’re looking for a new boiler and aren’t quite sure where to start, our guide to Glow-Worm boilers and the best alternatives is going to help you out. Below we’ll cover Glow-Worm prices, warranties, reviews, and how they stack up when compared directly to Worcester. Glow-Worm having been producing boilers since 1934 and now produce a full range of combi, heat-only and system boilers. Since 2001, they’ve been owned by one of the most reputable boiler brands in the UK; Vaillant. But, there’s no doubting that the Glow-Worm brand lags leading industry players such as Worcester, Baxi, Potterton and in fact, even Vaillant. How much does a Glow-Worm boiler cost? Typically, they’ll be in the low-mid range, when compared directly with a brand like Worcester Bosch or Baxi. As an example, you’ll be able to pick up the Ultimate 3 30kw for around £800. And, for a boiler with a 10-year manufacturer’s warranty, that’s a good deal. Compare that with a Worcester 30i combi, which is likely to cost around £1,000. Naturally, that’s going to make around £200 difference to the overall cost of installation, when you compare the two boilers directly using a local installer. However, the problem that mid-tier brands like Glow-Worm have, is that Bosch have now invested in an online boiler installation platform. Given the fact they offer fixed prices online, they remove the need for an expensive sales rep, or house visit. And, that’s then coupled with the fact that as Worcester supply the boilers, the company they invest in get those boilers dirt cheap. The end result, a local installer fitting a Glow-Worm boiler, is going to be similar in price to BOXT (the website Bosch has invested in), fitting a Worcester 30i. You can compare the two by getting quotes from local installers. And, you can then jump onto BOXT and fill out their 90-second form to get a fixed online quote (no personal details needed). As you may have noticed above, we’ve picked the Ultimate 3 Glow-Worm boiler for example’s sake. And, that’s mainly due to the fact that there’s a 10-year warranty on offer, comparable to the Worcester 30i. 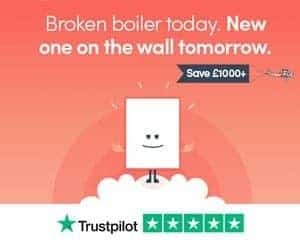 If you’ve read our other boiler reviews, you’ll know we never recommend a boiler that comes with less than 2-years warranty, and we prefer 5+. The fact is, the boiler makes up around 50% of the installation cost. So, if it fails, it’s not simply a case of buying a new boiler, you’re paying for labour all over again. And, we think manufacturer’s warranties are a good indication of what the brand thinks of their product, in terms of longevity. Typically, there’s little more than a few hundred pounds difference between the lowest and highest priced boilers in a brand’s range. Essentially, you’re getting great value for money by heading for a boiler in the 5-10 year range, rather than one with 2-3. Put simply, Glow-Worm is the budget arm of Vaillant Group. As with everything in life, you get what you pay for. Our opinion is to go for a Glow-Worm boiler with the highest warranty possible (so the Energy or Ultimate3 boilers), or to stick to well known brands including Baxi, Potterton, Vaillant and Worcester Bosch. So, we’d always tend to head for the leading brands in the industry, but we’re not completely against Glow-Worm. And, there are plenty of people that rate Glow-Worm as a brand. The reviews on Trust Pilot are a combination of homeowners and installers, rating customer service, through to product quality. Glow-Worm Boiler, Or Worcester Bosch Equivalent? With Worcester typically being around £200-250 more expensive from a local installers, there used to be a difficult decision to made. Do you go with a lesser known brand to save the cash, or pay the extra for one of the most reputable brands in the industry? Of course, nowadays, we’re reliant on technology, and the partnership between BOXT and Worcester Bosch means that essentially, you’ll be able to get a Worcester Bosch equivalent, fitted for a similar price, and get savings of up to £1,000 when compared with national installers. So, our choice? Get a quote from BOXT for a Worcester Bosch boiler (no site visit or personal details needed). And, if you’re still not sure, get an on-site visit from local installers, comparing to the fixed price online from BOXT. Thanks for reading our guide covering Glow-Worm boilers. Hopefully, there’s enough information there for you to make a decision on which boiler you should be installing in your property, without paying through the nose for it. We regularly post up fault-finding guides and reviews, so bookmark this page and pop back soon.